Dogs need regular exercise, but hot weather is no time for an intense workout. Plan walks or visits to our leash-free dog parks early in the morning or later in the day when temperatures are cooler. Hot pavement or asphalt can burn the sensitive pads on a dog's feet. Dog boots offer protection with the added benefit of no more muddy feet to wipe off! People and dogs need extra hydration during hot weather, but drinking lukewarm or room temperature water isn't too refreshing. Add a few ice cubes to your pet's water to keep it nice and cold. When you're enjoying some frosty ice cream or an ice-cold popsicle, let your pet share the fun with a homemade frozen doggie treat made from delicious ingredients like peanut butter, watermelon or yogurt. Collapsible dog bowls are inexpensive and portable so you can take them along on walks or car trips. Warm weather can make Fido drowsy, so place a damp towel on the floor for napping or just relaxing. Regular brushings do more than just keep your pet looking his best. A dog's undercoat is part of his natural cooling system, so maintenance prevents the hair from becoming matted and restricting air flow. Perspiration is nature's air conditioning for humans, but dogs sweat through only a small percentage of their body. On extremely warm days, swab Fido's paws with a cotton ball soaked in rubbing alcohol, which evaporates quickly and helps to lower body temperature. 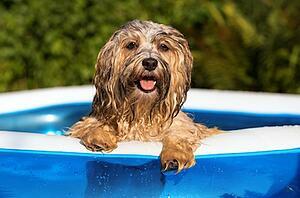 Do you have any go-to tips for keeping dogs cool? Share them in the comments!